This picture was taken before I completed my laundry room makeover. See that ugly box in the wall? If you have a washing machine in your home, you probably have one of these too. There was no way I was going to go to all the trouble of prettying-up my laundry room without figuring out a way to hide that ugly hole in the wall. Here’s what it looks like today. This project isn’t rocket science. It’s just an easy solution to solve an very ugly eyesore. Let me tell you what I did. 1 – 1″ x 4″ Board – The board should be at least as long as the total of the height of both sides of the box plus the width of the box. 1 – Single board that is wide enough and tall enough to entirely cover the front of the box. 2. 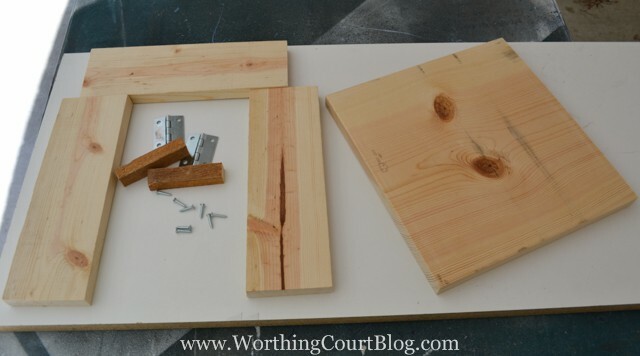 Considering the measurements of your box, cut two 1×4 boards that will be the finished height (sides) of the frame. Cut one 1×4 board that will be the width of the frame plus the thickness of the two sideboards. This board will be the top of the frame and needs to be long enough to go all the way across the opening and both of the side boards. Cut the board that will serve as the cover of the box so that it will completely cover the assembled frame. 3. Assemble the frame. If you examine the picture below, you can see how all of the parts of the frame are put together. I glued all of the places where the wood is joined and then added some wood screws for reinforcement. 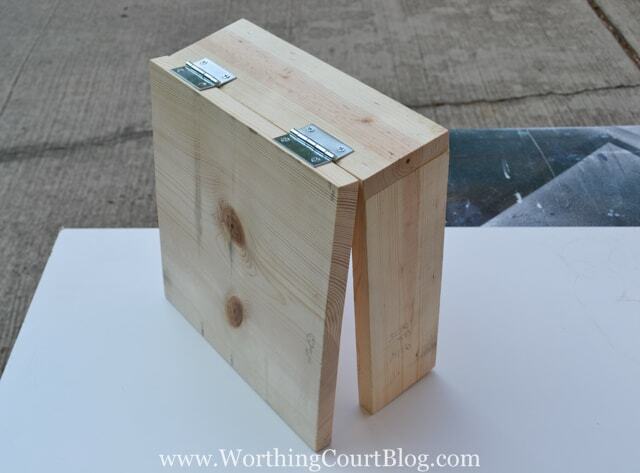 The two small blocks of wood are located up under the clamps. 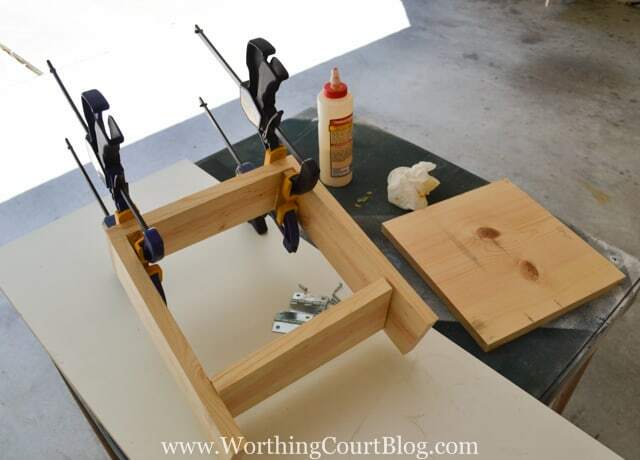 The board at the bottom of the frame, farthest away from the clamps, isn’t attached – it’s just there to hold the legs apart until the glue dries. 4. Once all of the glue has dried, removed the clamps. 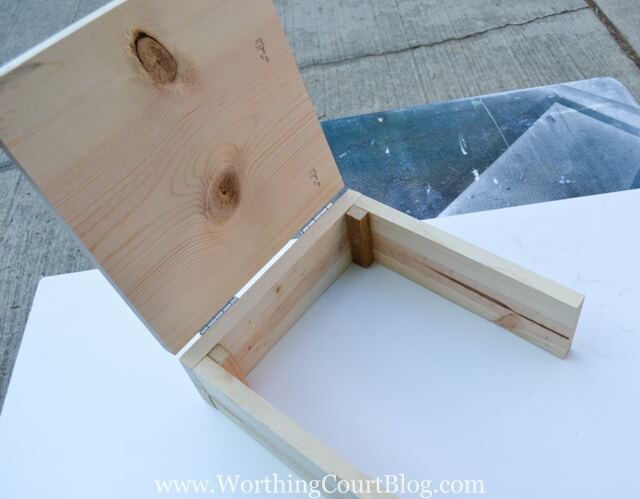 Attach the board that is the cover to one side of the frame using the hinges. 5. 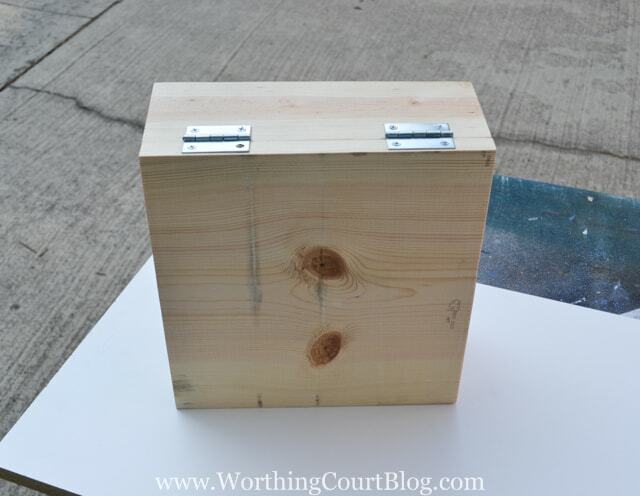 Spray paint the completed box and allow it to completely dry. 6. I forgot to take a photo of this step, but you should be able to easily understand it. 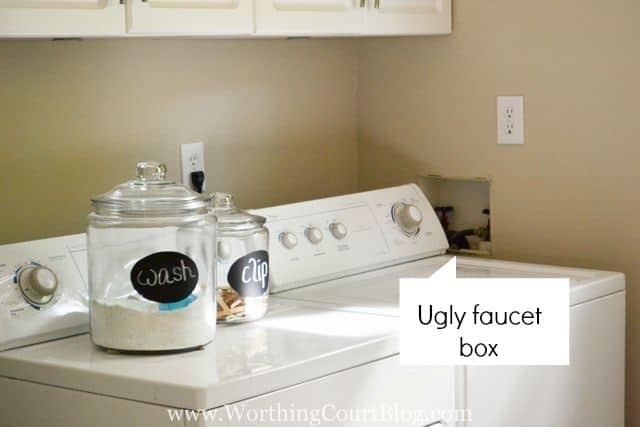 Attach the L brackets to the wall above the faucet box. Place the box on top of the brackets and lift the cover to be able to attach the box to the L brackets. Voila! No more ugly box in the wall, but the faucets are still easily accessible in case you need to get to them. 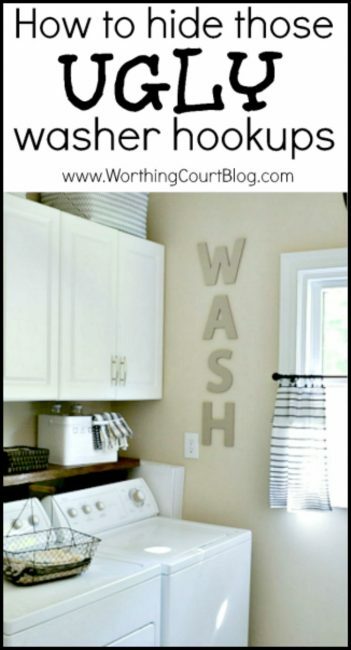 Click HERE to see more of my new laundry room! Great idea – my stupid cat is forever chewing on pipes and anything plastic. I am so going to box in my laundry pipes!!! How about buying a blank picture canvas from a craft store and painting it the same color as the wall? 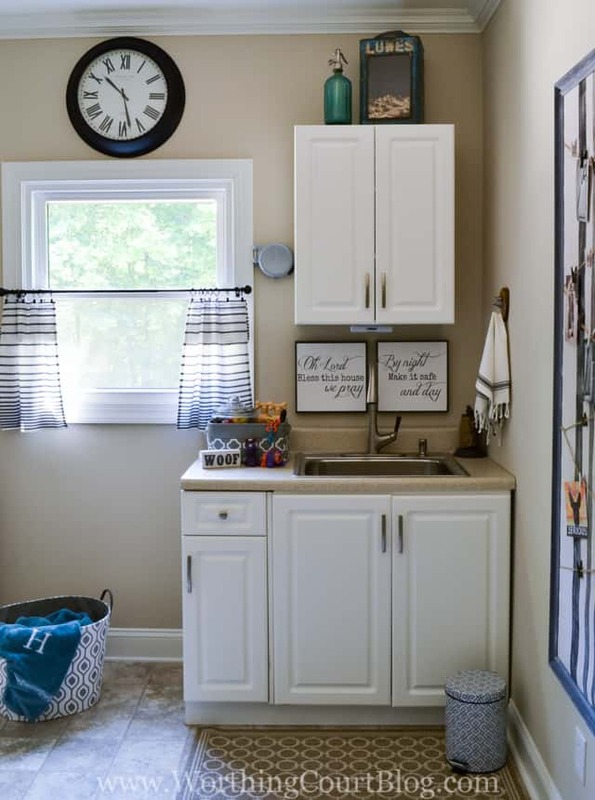 Suzy, your laundry room looks wonderful! I’ve been wanting a shelf over our washer and dryer and now I’m gonna get my honey to make one for them! Hi Bev. Look for a Design Dilemma post about hiding cords soon! In the meantime, can you email me a photo or two of your problem area? My email is: handgrs(at)gmail(dot)com. What a good idea. Thanks for posting. Hello from Share the Wealth Sunday. My connections would have been sooo much easier to hide if they had been located behind the washer instead of beside it. As it was, that big ole hole in the wall is the first thing that my eye went to when I walked into the room. Good luck with your garage! Awesome, I love your laundry room! I am currently revamping our laundry room and can’t wait to build a shelf to go over the washer and dryer. I agree…the hookups are an eye sore. What a great idea!! Will have to pin!! I like the idea of covering the faucet hole in the wall. Such an eyesore. I’m trying to imagine how it works in the end. Do you hook the box over the L hooks and let it hang there or did it have to be screwed on to the L hooks? Also, when you need to access the faucets, how does it open? Are the hinges on top or on the side? Hi Portia. The box was screwed onto the L hooks so that it wouldn’t fall off. To access the faucets, you open the box from the front. The hinges are on top of the box. Love the new laundry room. 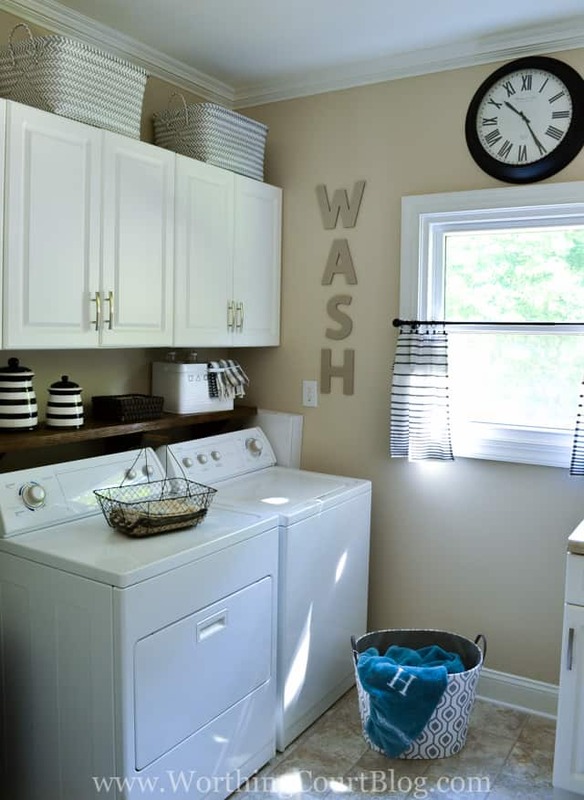 And love that metal box on the shelf above the washer. The white one with the laundry symbols, may I ask were you got it from?? Thank you, Amy! I found the white laundry box at HomeGoods. 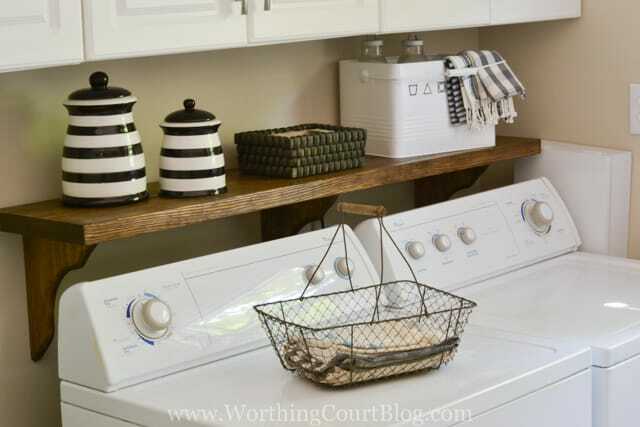 love the shelf over washer /dryer. Did you make the shelf or is it premade? Hi Michelle. I made it myself using a 2″ thick board and inexpensive wood brackets.